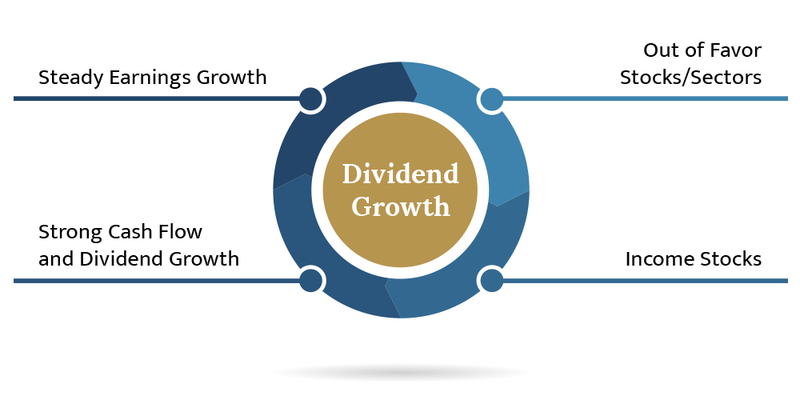 If your long-term objectives call for an investment strategy that produces consistent income with moderate capital appreciation and risk, our Dividend Growth Equity Strategy is a good starting point for the core equity allocation of your customized total portfolio approach. Historically, dividends have comprised over 40% of stock returns and helped buffer against market volatility. Dividend paying stocks mitigate downside risk and produce a consistent level of income. Dividend Growth portfolios hold 30-40 stocks with a track record of both growing and paying dividends. We will also take prudent risk relative to your goals and individual tolerance for volatility.